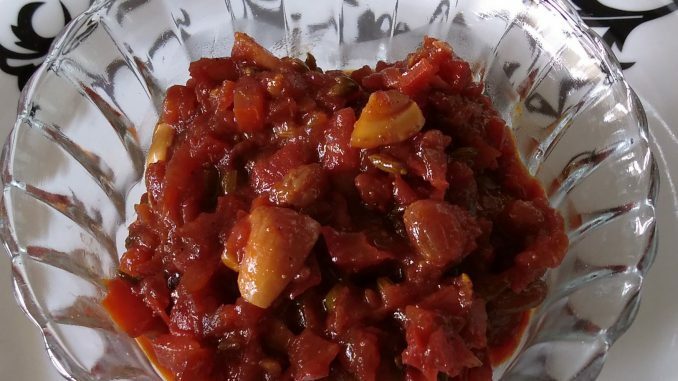 Recipe of this sweet and sour chutney was shared by a friend. This is so yummy that sometimes we have this chutney in place of subji. It’s an easy recipe and requires ingredients that are generally available in Indian kitchen. 1. Wash and chop Tomatoes in small pieces. 3. Add Asafoetida (hing), Cumin Seeds (Jeera) and Fennel Seeds (Saunf), when they start to crackle add chopped green chillies, sauté for few seconds and then add chopped Tomatoes, Coriander powder, Salt , Red chilly powder, Garam Masala , Jaggery, fried Cashew and Raisins. Adjust Jaggery according to your taste depending on sourness of Tomatoes. 3. Cook it covered, stir in between. 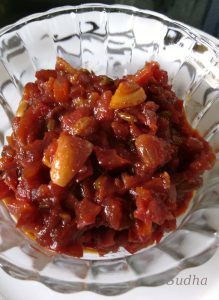 When Tomatoes are cooked and soft, mash them with a spoon, cook for one min more. Yummy chutney is ready. 4. Serve with Roti, Theplas, Parathas, or Rice / Pulav. This Chutney can be stored in fridge for one week.